Augusta, ME, October 12, 2017 – Southport Boats, a leader in offshore center console boats with a reputation for a smooth, responsive, and dry ride, today introduced the new 33 Dual Console (DC) model. The 33-foot Dual Console model expands beyond the current 33 FE and 33 LX models to deliver full forward seating, enclosed helm area, stay-aboard accommodations and cruising capabilities. The 33 DC is built on a Ray Hunt Design hull which combines offshore racing technology with cutting edge composite manufacturing to deliver a ride with incomparable stability. 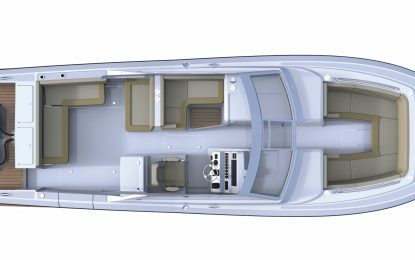 Comfort features on the new Southport 33 DC include twin 6-foot berths, a full size integrated hard top with power-retractable sunroof, and a raised port side co-pilot lounge with forward and aft facing lounge seats. 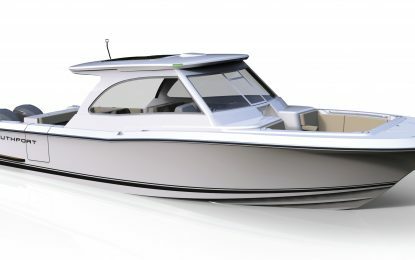 The integrated live well, fish boxes, storage and optimized cockpit layout appeal to the serious angler. The Southport 33 DC is available for pre-order through the Southport Dealer Network beginning in October 2017 with priority deliveries scheduled for April 2018.